As a hiring manager, you wish to hunt the most talented, qualified, and a well-versed pool of applicants through social screening. With over billion of users on social networking sites, social media has emerged as an excellent platform for recruiters to find suitable candidates. Social networking is one of the most elite solutions for hiring and sourcing employees in the organization as it is an exciting and innovative mode of linking potential employees and employers. The market for talented professionals is shrinking. Moreover, marketing through newspapers and online job boards is becoming quite expensive. In such situation, finding a suitable candidate for a defined job is becoming more and more challenging. 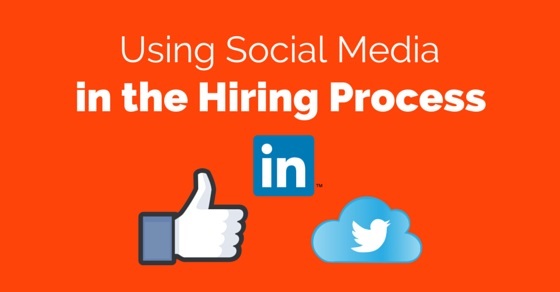 Hence, recruiters of both large and small companies leverage social media platforms such as LinkedIn, Facebook, Video chats, and more, to attract skilled job candidates. But, before reaping benefits while using social media for recruiting, it is first vital that recruiters understand when to leverage such platforms and numerous types of social media networks that they can use to find a potential candidate for their firm. Social Screening – How to Use Social Media in Hiring? It is extremely vital for recruiters to comprehend the best way to employ social networking sites for their work. Although there are innovative tools available for use, even to utilize them properly, the recruiters need to learn the art of effectively using social sites. So, here are some steps that you, as a recruiter, can follow to secure adequate results from your social recruiting process. You first need to generate a plan for your recruiting strategy. For this, you may consider your company’s long-term and short-term goals, type of workforce required to achieve such goals, the technology you will use for attracting them, ways with which you will keep your content attractive and fresh, and more. Besides these, you must also realize the time you are willing to spend on social networks and ways to keep the content updated. You may check online for your company’s brand, its job openings, and agencies that are promoting it. This will provide you with the actual idea of your company’s image online. Next, utilize this information to manipulate candidate’s interest in your brand. You need to engage with potential candidates by initiating a dialog with them. Be genuine, transparent, and approachable. If you make fake communications, then there are more chances that the potential candidate will not trust you and your organization. To make sure that your social recruiting strategy yields adequate results, it is vital that you select a precise networking platform according to your company’s requirements. Your platform must be by the particular target audience. For instance, if the type of candidate you wish to hire holds a more active presence on Facebook than LinkedIn, then you may focus more on other side or may expand. One advantage of social media recruiting is that it allows recruiters to research large pool of candidate with ease and in less time. But, every social networking platform has its set of criteria and parameters to search adequate candidate. Therefore, you must first see to such parameters and then go for targeting the candidate that best meets your requirements. Don’t make the application process the first step in the hiring process. Maybe, the recruitment board has generated a job posting that is exciting and attractive, but if the application process is complicated, then might be the candidate will become disinterested to applying it. It would be better if recruiter provides a direct link to their job pos or company’s career page. Candidates interested in your job opening will revert to you only after conducting research about your company. The Maximum chances are that they will respond and check your social accounts only. So, it is essential that you keep your company’s social accounts updated. Also, you must provide complete information about your organization in its profiles. It’s true that there are some risks associated with the recruitment process carried through social networking sites, but first you read what are the benefits offered by it. With billions of users on various social platforms the visibility of your firm will increase to a great extent. This will also improve the online visibility of your job postings that numerous candidates will notice. This is also a sign that the company is updated with technology and following the latest trends. As compared to other types of recruitment methods, this form of recruiting involves less cost. The company may spend comparatively less amount of money on social media strategies and various tactics involved in it. People who are well-versed in social media and tools related to it are very much in demand in the present world. It is because they are perceived as innovative and tech savvy. It might happen that passive candidates (who are not looking for a job change), may change their job if they came across an interesting job opportunity. You may get to know about such candidates through their social networking profiles. If a business can work well by procuring referrals then referrals may also reap great results in the hiring process. It can be an excellent strategy to utilize numerous social media sites to make job seekers aware of current job openings in your organization. The traveling speed of online modes is very fast. Recruiters can circulate their job opening link to multiple platforms in one go. Even job candidates can apply to different posts with ease and in less time. If potential applicants already have a connection with existing employees, then it is a sign that the new employee will be a better fit for the company. Developing a corporate social media presence can make you have a competitive edge over companies who are still not implementing it. You can drastically reduce your sourcing costs and boost ROI through powerful social networks. Posting job openings on numerous social networking platforms can deliver more productive returns as compared to the posting job on a single portal. Potential candidates are interested to work for companies who is interested in reaching them. You can, therefore, attract candidates by showcasing them with services and offerings that your organization offers to its employees. For potential candidates who think that employers should not have the right to visit their personal networking accounts might take a serious action against it. It is because even candidates who allow their profile to be viewed by the general public may ask the employers to permit them a reasonable amount of privacy. This is another major risk that the employers might have to face if they adopt social recruiting methodologies. State and Federal laws prohibit discriminatory hiring decisions based on sensitive categories such as color, religion, race, and more. Conducting background checks of candidates with the use of social media sites might generate a setback that you have selected the candidate because it belongs to a particular protected category. So, if you wish to hire candidates through social networking sites, then make sure you do not discriminate among them. Employers are not sure about the information that they are receiving. Maybe the information is not correct or partially correct. It is because anyone can create a profile on social platforms with fake information. So, it is impossible to tell that whether the information is authentic or not. Also known as FCRA, it is the governing body for employment background check for the purpose of hiring. It is applicable when the employer employs a third-party company to screen and cross-check the employer. As according to it, if you are utilizing activities of a third party for recruiting a candidate, then the applicant must be informed in prior for such investigation, providing an opportunity to consent. In most of the states, employers are legally not permitted to ask their employees or potential candidates with passwords of their social networking accounts. So to avoid entering into any dispute, it is wise if you don’t ask employees for their passwords. Instead of asking line manager to search and check for an applicant, it is better to ask the HR manager to do this. It is because the HR manager has a deep knowledge of what is best suitable for the organization. It is also possible that you may use social networking tools to cross-check about any employee, once the application is received, or the applicant is interviewed. This will be a more protected step towards using social networking sites for the hiring process. It is wise to print the page with social media content on which the entire hiring decision is based. In case of any rejection, you may also record that on a printed page. It is essential in case your decision is challenged and also the decision-making content is deleted. There are more other laws linked with social media recruiting process other than the FCRA. So, be familiar and have knowledge of all such laws to fight back any trouble with ease. Before you finally decide on a social strategy to implement, you may track key metrics on your present recruiting and sourcing efforts. After this, you need to set goals that you wish to avail of your social recruiting process. Social networks are a potent tool for recruiters to reach a large pool of skilled and proficient candidates. Establishing your company on the social networking platform also speaks a lot about your business and generates a perception of employees that you are interested in connecting with them. But, it is also true that hiring through social networks might not be the complete solution. You can, therefore, use it as a complimentary program with other recruiting options, before you are proficient at it, to make sure you can hire the best candidate for your job posting. Once you think that you have become well-versed with it then surely you may secure all benefits offered by this amazing recruitment tool.